The Healthy Ageing Premium Pack is an exciting new addition to the recently updated Isagenix line. If you are wanting to age better, improve your health, stay lean, maintain sharp focus, this is your pack! This pack is the ideal solution for individuals interested in improving their vitality and providing their body with the best nutrition the world has to offer. By adding the power of nourishing meal replacements and innovative supplements to nutritional cleansing, this pack is designed to help promote weight loss, boost energy levels, improve overall health, and glow from the inside out. 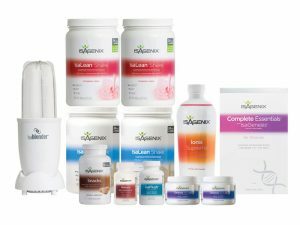 If you are interested in a smaller ageing pack, be sure to check out the new 30 Day Healthy Ageing System from Isagenix. 4 Boxes or Canisters of IsaLean Shakes in the flavour of your choice (choose from chocolate – both with dairy or dairy free options, vanilla – with dairy or free of dairy, and strawberry – dairy only). 2 tubs of Cleanse for Cleanse for Life to help remove contaminants and toxins that have built up in the body over time. 1 box of Complete Essentials Daily Pack to help improve your mental, physical, and cardiovascular health. 1 bottle of IsaFlush to help boost overall health by supporting a regular, balanced digestive system. 1 bottle of Natural Accelerator to support a boost in energy levels and overall health with the addition of ingredients such as green tea, cayenne, ginseng, and cinnamon. 1 tub or bottle of Ionix Supreme to decrease fatigue, improve energy levels, and increase focus and mental clarity (your choice of a liquid or powder form). 1 bottle of tasty Isagenix Snacks to curb hunger and fight cravings. 1 box of Replenish Sachets, a delicious drink comprised of essential minerals along with vitamins A, B, and C.
How Can You Buy the Isagenix Healthy Ageing Premium Pack?